The French president Emmanuel Macron is taking steps in line with the Pope in his recent meeting with Mark Zuckerberg to combat “fake news”. The Pope is prophesied, according to Daniel 11:44, that “news” would trouble him, which would lead to an aggressive attack, even equating those who spread the prophecies of Revelation exposing the Pope as “terrorists” or “extremists”. Yet Marcon’s overtures to the agenda of Pope Francis will not only affect the country of France, but now is is confirmed that it will affect Facebook, with the potential of rippling into more social-media platforms. In recent months, France and its fellow European countries have adopted a much harder line against Facebook and its social-media peers, demanding they police their platforms more aggressively to stop a range of digital ills — including “conspiracy theories, fake news and terrorist propaganda”. 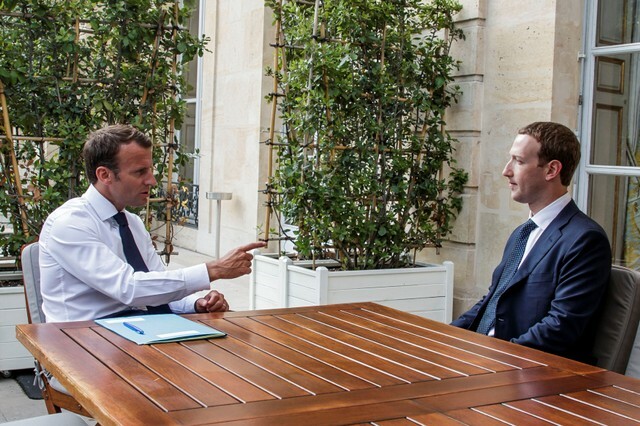 Macron pressed Facebook chief executive Mark Zuckerberg on the issue when the two met in Paris earlier in 2018. The European Union, meanwhile, proposed levying steep penalties on sites that fail to spot and take down terrorist content within an hour. “Today the Internet is much better used by extremes, authoritarian regimes or terrorist propaganda than by our democracies,” Then he concluded, “It’s a reality against which we must fight.” France’s new efforts come in the wake of Macron’s earlier attempt to combat “fake news” through a new bill adopted in July. The “fake news law,” as it has come to be called, will allow French judges to halt the publication of information determined to be either false or “implausible.” This would give the right for unbelieving judges to condemn and consign the Word of God’s sure word of prophecy to prohibited material for publishing. While the book of Revelation pronounces a blessing upon those who read and “hear the words of this prophecy”, the Scriptures foretell that publishing it will be forbidden in the near future. “Behold, the days come, saith the Lord GOD, that I will send a famine in the land, not a famine of bread, nor a thirst for water, but of hearing the words of the LORD” (Amos 8:11). In May 2018, Macron organized the summit in Paris for the world’s biggest tech executives, including Facebook’s Mark Zuckerberg, to discuss ways to work towards regulation and stated in the press conference that “I believe in innovation and at the same time in regulation and working for the common good.” That same common good which France vowed to the Catholic church to help advance is the same regulations they would maintain in helping to regulate Facebook. Such regulations would silence the warnings against receiving the mark of the beast, which is Sunday sacredness according to the Catholic church’s own admission. What has resulted from the summit between Macron and the world’s biggest tech CEO’s? Starting in January 2019, Facebook will welcome a small team of civil servants from Macron’s administration to shadow Facebook’s checks on “hate-fueled” content. According to Reuters, the team may be drawn from the telecoms regulator and the interior and justice ministries. If the six-month trial embed proves successful, Macron hopes to expand the arrangement to other giants like Amazon, Apple and Google. At the same forum on Monday, Macron urged nations to sign on to a global declaration to regulate cyberspace. Soon, very soon, Facebook will be deeply regulated at such a level that the prophetic message of God’s word will be silenced. Disinformation, extremism, hate speech, and fake news; all terms used to condemn the faithful watchmen on the walls of Zion from publishing the warning against the beast, the image of the beast, and the mark of the beast. Time is short. May we advance the truths of the third angel’s message while it is yet day, for the night cometh when no man will be able to freely work.